We had a lovely evening. With all wines served in similar newspaper-based disguises, and with a couple of non-Aldi ringers thrown in to keep everyone on their toes, everyone tried everything before choosing their top three and bottom three. 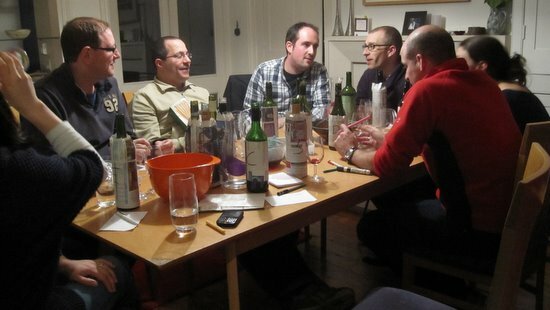 Consensus was nowhere to be seen, with every single wine featuring among somebody’s favourites and somebody else’s rejects. It was going to be a brilliant blogpost. One of the best. But then, in an incident which has come to be known as the Great Note-Disappearing Scandal of 2011, everything I had written on the night was lost, and with it, any chance of the blogpost ever being published. It was my lowest hour, a personal humiliation. This is the bargain of their range, in the shops all year round a hit both times I’ve tried it. A bone dry sparkler that’s lovely on its own and clean and gentle enough to work well as a base for cocktails. The bubbles aren’t enormously persistent, but it’s unlikely to matter that the wine goes flat in five minutes when glasses will be empty in three. Even the half-price Champagne that swills around supermarket aisles at this time of year looks pricey by comparison. I’d be very happy to make this my official house sparkler of the 2011 festive season (had I not already stocked up with this). This would make a decent gift, because it comes in a nice bottle with some embossed bits and was crafted in one of France’s most famous winegrowing areas. But the bottle and the label are costing a good few pounds here – this is a nice, soft, gluggable grenache, low in acid and tannin, of the sort that you can pick up in most good retailers (from a less sought-after region) for around £6.99. 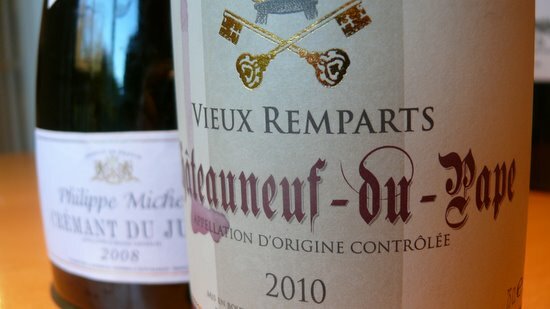 It’s only distantly related to the famous Chateauneuf domaines, just as cut-price supermarket champers is a very distant cousin of Pol Roger. Still, when Tesco’s Chateauneuf is over £15 and Sainsbury’s a penny less – and both those bottles, in the Finest and Taste the Difference range respectively, come covered in supermarket branding and are thus considerably less appropriate as gifts – I guess this must be seen as something of a bargain. This went on sale on Monday, and is out there while stocks last. Proper vintage port is still scarily expensive, but every other variation on the theme is puzzlingly cheap. This is good stuff, with a pronounced pong of leather and tar and chocolate and blackberry and kirsch – my little glass made an entire room smell of festive celebration – and deep, rich, warming flavours of cooked berries and plums and chocolate and spice. It’s lovely, and (while pretty much the going rate for LBV) a great bargain, and I can absolutely see it trotting off down the aisle with a truckle of Stilton at the earliest opportunity (like most wines with a bit of sweetness to them, I find it’s better with salty food than sweet). Highly enjoyable, this also went on sale on Monday and is there while stocks last.